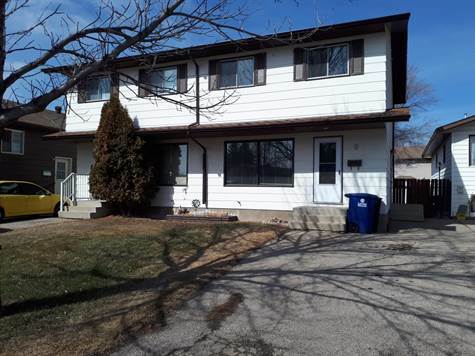 "Location Location close to schools"
Premium location for this side by side duplex. Live in one side and rent out the other. Location makes this duplex easy to rent. Close to public and separate schools, parks and shopping. Quiet cul de sac location. Each side has 3 bedrooms, 2 bathrooms. Huge living room and a good sized kitchen with lots of counter space and built in dishwasher. Large bedrooms up with a cheater door going from the master bedroom into the main bath. Pride of ownership is apparent. Many upgrades have been done throughout the years including flooring and paint, exterior doors and bathroom fixtures and surrounds. Fully landscaped. The separated yards give lots of privacy. Fridge, stove, washer, dryer, dishwasher in both sides included. Long term renter would like to stay.